Cycling, Health - and Safety? There's a lot of bikes about in Yorkshire at the moment! Something to do with the Tour de France I'm sure, but hopefully also a sign of people trying to get fitter. And there's no doubt that cycling is good for you – provided, that is, you can avoid accidents. There’s no more vulnerable road user than a cyclist, and many people I know have had accidents, near misses, or simply been terrified cycling around Leeds. Data recently published by the Office for National Statistics (ONS) also makes grim reading. 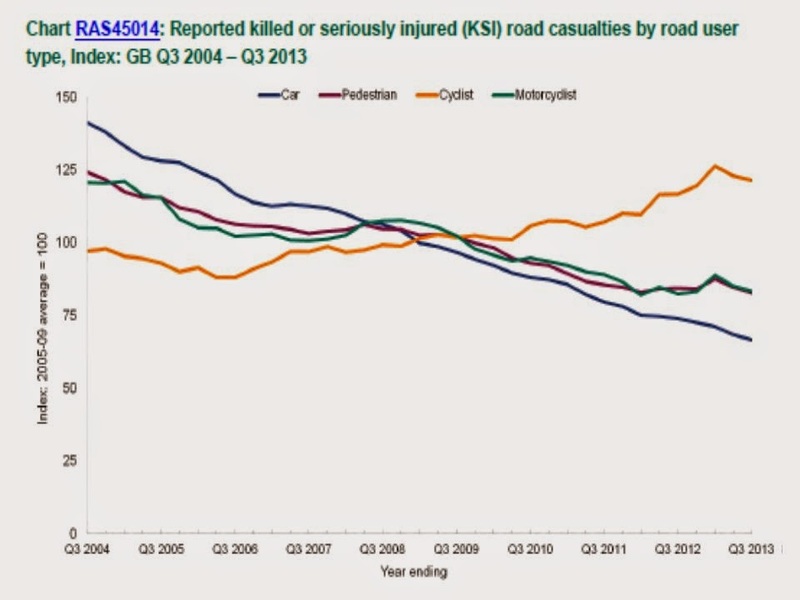 Basically, despite increasing traffic, the number of people killed and seriously injured on Britain's roads has steadily fallen over the past 10 years. EXCEPT for pedal cyclists, where numbers continue to rise. British Cycling, in their Choose Cycling campaign launched earlier this year, cited research from Cambridge University*. This indicates a net benefit from people cycling more, even taking account of this accident risk. Reductions in cancer, heart disease, diabetes and other conditions would outweigh more injuries, and could yield huge savings for the NHS as well as benefits to individuals. • They assume that increased cycling will be exactly matched by reduced car use. Aside from the impracticality of this, a direct linear connection between traffic volumes and cycle accidents isn't proven. Conclusions? Well, whatever its causes the rising number of cyclists killed or injured must be addressed. Some things we can do ourselves, such as sharing low-traffic routes and other safety advice. Other measures need local or national government action, and British Cycling's 10 point plan** provides a sound approach on these issues. Meantime, my own cycling remains restricted to leisure time on quiet country lanes. I wish I could do more.